Asteroids are lumps of rock, and most of them are found in a region called the Asteroid Belt, which lies between the planets Mars and Jupiter. Meanwhile, comets are lumps of ice, rock and dust, which is why they are sometimes called "dirty snowballs". Most comets are found in the outer regions of the Solar System, further away from the Sun than the planets Uranus and Neptune, in a region called the Oort Cloud. However, not all asteroids and comets are well behaved and stay in these regions. Sometimes comets pay a visit to the inner parts of the Solar System. Comets are great to observe when they are near the Earth, as some of the ices evaporate because of the heat of the Sun, creating a wonderful "tail" as it travels across the night sky. Asteroids also sometimes pass by the Earth. Small pieces of asteroids that enter Earth's atmosphere are called meteorites. As they travel through the atmosphere, the meteorites burn up, which is why they are also called shooting stars. Astronomers now think that the same thing may happen to asteroids that find themselves at the center of our Galaxy, the Milky Way. At the center of most galaxies there is an object called a super-massive black hole. Anything that gets too close to a super-massive black hole is pulled to it with such a strong force that it has no chance of escape - not even light! 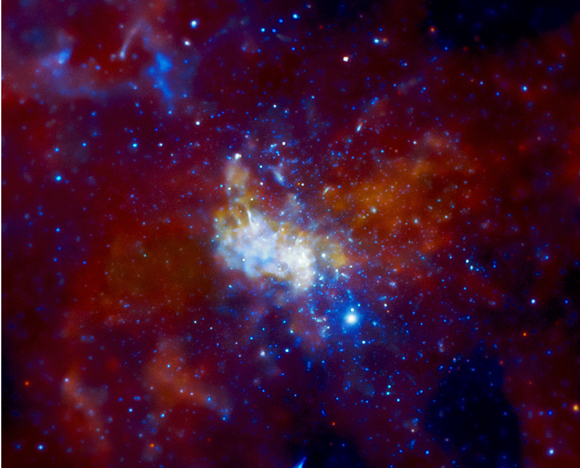 The super-massive black hole at the center of our Galaxy is called Sagittarius A*. Over several years, astronomers have noticed mysterious flares of X-ray light coming from Sagittarius A*. 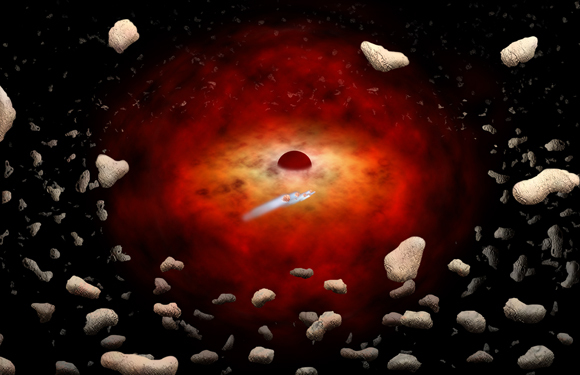 Now, astronomers think that these flares of light may be caused by Sagittarius A* gobbling up asteroids, just like the streak of light that we see in the night sky when meteorites (or shooting stars) burn up. If this theory is correct, then there must be hundreds of trillions of asteroids and comets around Sagittarius A*! Cool fact: It's not just super-massive black holes that asteroids and comets need to be worried about: about once every three days a comet is destroyed when it flies into the hot atmosphere of the Sun!